There’s a little more evidence that Apple’s wireless charging mat is right around the corner. The recently-launched wireless charging case for Apple’s AirPods is starting to reach customers’ hands, and it comes with a surprise: there’s a picture of the AirPower charging mat on the box, even though this isn’t available yet. Apple promised to have AirPower in customer’s hands last year, but that hasn’t happened yet. Still, there have been numerous unconfirmed reports indicating that the release is coming soon. Adding to this evidence is the product apparently showing up as Apple’s recommended method for sending power to the new Wireless Charging Case for AirPods. The charging mat shown on the packaging isn’t labeled, and could be something besides AirPower. But it’s exactly the same size and shape as the product Apple showed off. Still, the wireless charging case doesn’t require AirPower. It supports the Qi standard and can get current from any wireless charger that also works with an iPhone. Back in 2017, at the same time as the debut of the iPhone 8 and iPhone X, Apple announced AirPower, a multi-device charging mat. This was originally scheduled to be out in 2018 but we’re still waiting. Part of the long delay is supposedly the result of developers running into problems with overheating. But these seem to have been solved as there have been numerous unconfirmed reports recently that AirPower will launch any day now, including support for it in iOS 12.2. This won‘t be just three charging mats mashed side-by-side, as its rivals are. 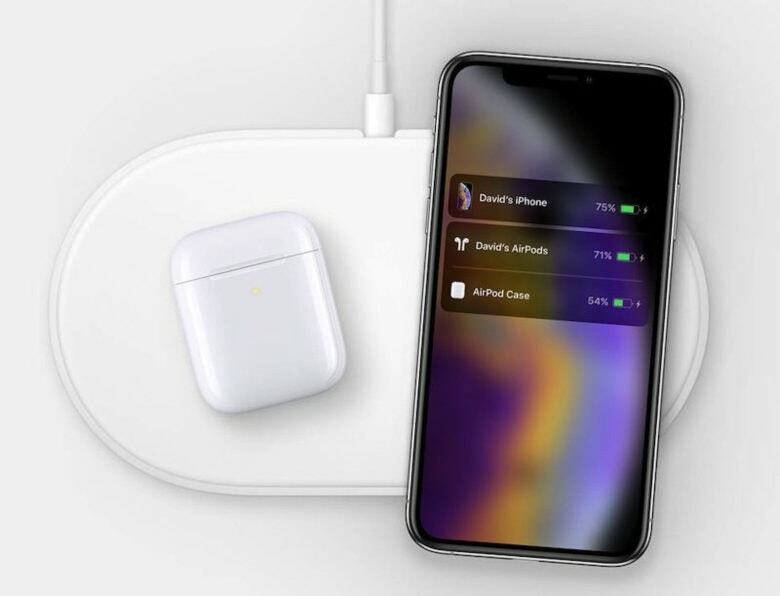 When an iPhone is on the charger with other Apple products, the phone’s screen shows the charging status for all of them. Even better, Watch, phone, etc. can be arranged in any way on the charger.